Fuller Center for Housing President David Snell knew it was a monumental challenge to try to foster a little peace between North Korea and the United States through the construction of simple, decent homes. In the end, it proved too monumental a challenge. The peacebuilding idea was first brought to then Fuller Center President Millard Fuller in 2008 by Don Mosley, who helped Fuller start Habitat for Humanity and went on to found Jubilee Partners, a Christian community in North Georgia that extends hospitality to newly arrived refugees from around the world. Fuller tasked Snell with leading the effort. Snell, who was named president of The Fuller Center after Fuller’s sudden death in February of 2009, would go on to make four trips to North Korea. 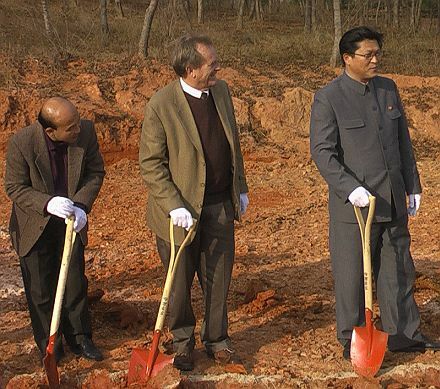 He brokered a memorandum of understanding in which The Fuller Center would build 50 homes for families in a farm collective known as Osan-Ri just outside of Pyongyang and was there for the project’s groundbreaking in November of 2009, as was Mosley. Working with North Korean leadership, though, grew more cumbersome over the next couple of years and the project was put on indefinite hold when leader Kim Jong Il died in December of 2011, just a few days after the final Fuller Center team visited the project. The Fuller Center today is coming off of its most productive building year ever and is piling up success stories, but Snell took a moment this morning to reflect on this non-success story. He has visited 25 countries, but he has seen North Korea in ways that few Americans ever have or ever will. How did this Fuller Center project in North Korea begin? This all started when our friend Don Mosley from Jubilee Partners, who’d been involved with Millard since Mbandaka (where the Fullers worked in then-Zaire 1973-76) came to us. He’d made friends with Dr. Han Park at the University of Georgia. Dr. Park was well-connected with both North Korea and U.S. leaders and was able to navigate between the two. They came up with the idea of The Fuller Center building some houses in North Korea. The idea was that we would fund them, but we’d work with the North Koreans to design them. So Dr. Park arranged for a small group of us to travel over to North Korea, and we met with officials at the Paektusan Academy of Architecture, who were going to carry the ball on the Korean side. We started talking about it, and it sounded like a pretty good idea. Did you get any pushback against this idea of working with North Koreans? Actually, very little. We had one donor who wrote and said he’d never give us another dime because we were “cavorting with the enemy,” but that was the only real visible objection. I’m sure there were people who were concerned, but that was the only actual resistance we got. David Snell (center) at the Osan-Ri groundbreaking on Nov. 11, 2009. What was the actual housing plan for Osan-Ri? They initially wanted us to build in Pyongyang, but everything in Pyongyang is huge, very expensive condominium-style apartments and housing blocks. We said no, that we would build in the country where we’re comfortable and we’ll build single-family homes. So we ended up in Osan-Ri and were going to build 50 houses there. It was a farm, apple farm as I recall. Some of the housing was derelict and needed to be replaced. Then they were going to continue the project and build another 150 houses. You knew how tough this would be. Why even try? If you don’t try, you know your result will be failure. And in the early days it was actually very encouraging. The folks in Korea were embracing of the notion by all appearances. Met some wonderful people there. The idea of doing something collaboratively like this would demonstrate both to Koreans and to Americans that we’re not all that different and that our governments don’t agree on things, but we can get along. So there was real momentum in the early days — on both sides — to do this. What got in the way of that early momentum? Well, we had some disagreement over the house plan itself. I visited a number of rural communities in North Korea and visited the homes there. They were really quite lovely homes — small but lovely two- and three-room homes. But they seemed well-built and were comfortable. So we were trying to design something that would accommodate that. There was some back and forth on what the actual house design would be. There also was the building system itself. We were prepared to introduce a new system there. 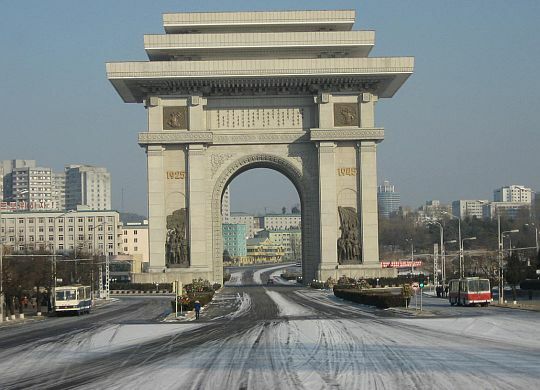 It’s cold in North Korea and they used asbestos panels for insulation. We were suggesting a sort of Styrofoam block kind of system that we could bring in from China. They were actually kind of excited about that. We ended up bringing some of those blocks into the country. It got worse and worse. I think what really happened was that in the early days they expressed excitement about the volunteers coming in. But as this thing progressed and it looked like something might actually happen, they weren’t so sure they wanted that feature. It finally ended when they said, “We can do this. Just send us the money and we’ll build the houses.” That flew in the face of everything we were trying to do. The volunteer piece was fundamental to it. When that started to go away, then it appeared that we might not be able to do this. In December of 2011, we sent a team of six Fuller Center volunteers to check on the project. A few days later, leader Kim Jong Il died. What were your hopes for the project and the country itself at that point of transition to the current leader, Kim Jong Un? We worked pretty well when Kim Jong Il was in power there. He actually visited this site and had eyes on the project which made it more difficult for the Koreans because they were under the gun. When he died and the son took over, we were hopeful. (Kim Jong Un) was Western-educated, and maybe he’d bring new eyes and a new approach. It hasn’t turned out to be that way. I’m actually thankful every day that we aren’t sending volunteers to North Korea because things certainly changed, but not for the better. What were your impressions of the country and the people from your four trips there? They have a whole different life. They’re totally isolated. There’s no information coming in. There are three TV stations and they all play the same thing — it’s all propaganda. And they’re taught from an early age that we are the enemy, America is the enemy, and that our goal is the destruction of North Korea. Regime stability is probably the most important thing for the government there. They watched their neighbors and what happened in the Soviet Union when Western influences started to show up and Western TV and movies came and they couldn’t support that socialist system any longer. So they’re keeping it out, and they’re very effective at it. I found that the food was delicious. I did not see starvation on a mass scale. Like I say, I can only report on what I saw, but I saw a fair amount. Is it true that you went to church in North Korea? I went to church. Again, people say it’s staged but it seemed like there was a lot of sincerity in there. It was sort of a Presbyterian-style service. The choir was magnificent. They seated the guests up front, and we had headphones so we could pay attention to the sermon. There were a couple of times that the headphones went blank, so I figured the pastor must have been saying something they didn’t want us to hear. At the end of the service, they walked us down the aisle, and the choir sang “God Be With You ‘Til We Meet Again.” It was very powerful. Then the members left by the side door, and a very interesting thing happened that told me that maybe there really was some sincerity in all of this. Everybody in North Korea has a pin that they wear over their heart. It used to be a picture of Kim Il-Sung, but then it became both Kim Il-Sung and Kim Jong Il. Everybody has one. I tried to get one, but they told me no. When they left the church, I saw people putting their pins back on. So, they took their pins off to go to church. I might be reading too much into it but that seemed to indicate to me that there might have been some sincerity. There are only two or three churches in Pyongyang, and they’ve done a very effective job of promoting atheism there. But, nonetheless, there is a spark of belief. We like to tout The Fuller Center’s success stories, like our record building year we just had. How does this non-success story of North Korea fit into the annuls of The Fuller Center? It fits just where it ought to. It was certainly not a success in many ways — in any way, actually. But it was an education. We tried something. We’re talking about a global thing. I realized when I was over there that we weren’t dealing with peers. We were negotiating with the government of North Korea. But if you don’t try, you know you’re going to fail. We tried. We were blessed in that it didn’t happen because it’d be a terrible thing right now. It’s not a good time to be an American visiting North Korea. The volunteer component would have crumbled anyway. But you learn from your failures. Now, I don’t know anywhere in the world we could go that would be as challenging as North Korea. Cuba would be a cakewalk compared to North Korea. But we reached out and actually made some relationships. They can’t sustain themselves because we can’t communicate with them. And we don’t know what we left behind. We don’t know whose lives we may have touched. We’ll never know, but, by golly, we made the effort. 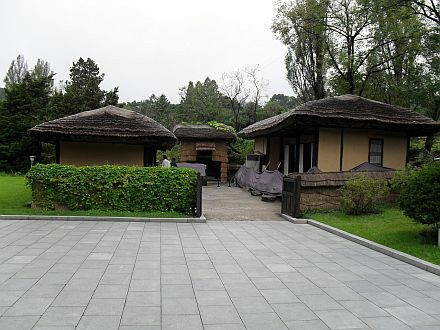 Kim Il-Sung’s birthplace and childhood home, as photographed by David Snell in 2009. With all the tension between the U.S. and North Korea today, do your experiences there put a human face on this political turmoil? It does for me. I know some of these folks now. I’ve met them. One of the folks that I worked with there I really enjoyed, just a wonderful guy, was in the equivalent of our State Department. Recently he was posted in New York at the United Nations. There’s no way I could call him up and say, “Hey, how are things?” But he was a very decent man, and I wonder what’s going through his head as we’re watching all of this happen. There’s an interesting bunch there. When you arrive in North Korea, you’re met by your translator, who is with you the entire time. You don’t leave the hotel without them. It’s their monitoring system; I’m not naive to that. But a couple of these guys were very interesting young men. They’re exposed to the West. One of them came to me — in the upper floors of the hotel where the tourists stay, they had BBC and China TV in addition to the local stations — and he came to me and said, “Do you have BBC up there in your room” I said yeah. He said, “Can I come up and watch the news?” I said, “It’s fine with me; I don’t know about your folks.” It was a 20-minute thing that came on at five o’clock. He knocks on the door at five o’clock, I let him in and he came and sat five feet in front of that television set, absolutely riveted for the entire broadcast. When it was done, he thanked me and left. But there’s a corps of these folks, a fair number of them, because every foreign visitor has someone to accompany them. I think at some point this is gonna fail; this regime can’t sustain itself. And when that happens, I think these people are going to be in an interesting position to help guide the future. I was very taken with their intellect, friendliness and interest. 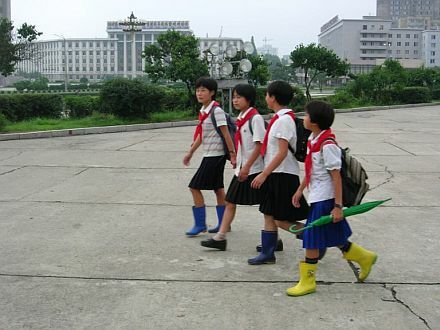 We’re sharing a photo gallery (below) of just some of the images you’ve captured in North Korea. How did you bring home so many images? I see these things on Facebook — photos that the North Koreans don’t want you to see that some guy is secretly taking — I took pictures the whole time I was there. I’d ask. … One place we went when we were first looking for a site out in the country, we could see in the distance artillery covered in camouflage. I thought, hmm, we might have gotten too close to that particular post. But I never had a problem and didn’t have a problem getting my camera out of the country. So, I don’t know. We blow things up in the West. One of the things that always bugged me about Kim Jong Il was how he was always portrayed as a buffoon, and he wasn’t a buffoon. He was an autocrat. He was a dictator. He was cruel. But he wasn’t a buffoon. Now this youngster (Kim Jong Un), I’m not so sure about. One of the things I’ve learned from this and from my other travels is if we could get governments out of the picture, we could probably all get along. The Koreans, really, on a 1-to-1 basis, love to get to know folks. And that’s true all around the world. If we could get governments out of the picture, we could probably have peace. That is all very interesting! I remember when this effort was underway, and then when it ceased. Yes, considering today’s political climate, it’s a good thing that this project did not move forward. It would be so wonderful if people all around the world COULD connect, help one another, and be friends, of course.